If you are a horror lover like I am, you are going to love Horror Pack! Horror Pack is a monthly blu-ray and dvd subscription box service that sends you 4 horror movies each month, directly to your door starting at $20 for dvd and $25 for blu-ray. 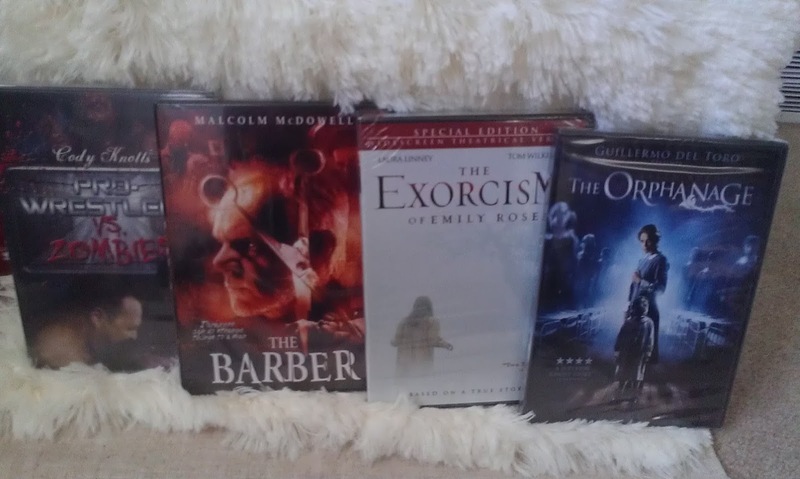 I absolutely love the idea of this box because I can quickly build my horror collection for a really low price and it even helps me discover new movies I may have never heard of. They do have a short list of movies that you may be able to expect in future boxes including very popular franchises like the Friday the 13th movies. I know that they are looking to bring more popular titles as well as films from independent and underground filmmakers. The first box shipped out this month (October 2015) and I received the dvd box. Above you can see that they are all brand new dvd's that are still factory sealed. So you are getting brand new and not used each and every time. Out of the 4 titles I got (Pro-Wrestlers vs. Zombies, The Barber, The Exorcism of Emily Rose, and The Orphanage) I have seen two of them, however, I didn't actually own any of them until now so that was nice. Everyone gets the same thing in each box, the only difference is that you get 4 titles in the dvd box and 4 different titles in the blu-ray box. So basically, if you subscribe to both boxes, you get 8 different titles! You may have more chance to get older titles in the dvd box than the blu-ray box as there are some titles that may not have been re released on blu-ray yet. This may be a huge factor for you when deciding which box to subscribe to especially if you prefer the classics.